Clarity Creates Abundance. I Went Broke Before the Lesson Stuck. Learn From Me! You can't do it all. You CAN'T do it all. You can't do it all. How often am I going to have to drill that into my brain until it sticks?! If you're like me, you pile way too much on your plate; chronically. I recently had to hit rock bottom to accept the truth wiser people have told me for the past year; clarity creates abundance. An unexpected bill hit, a client couldn't pay for marketing work, and suddenly I was almost 100% broke. With hard work and help from my mom and boyfriend, who helped me set-up and make merchandise for local markets, I bounced back and even have a tiny bit of a head start towards next month's bills. These are the lessons I learned from the recent experience. The random gigs were just not reliable as my income slumped. My markets and online sales, while good, where not enough in the face of unexpected situations. I looked at other marketing and photography jobs I'd have been a shoe-in for, but I want to save my creative energy for my own business. I swiftly started a well-paying, low-thought part-time job with flexible hours that I'll tell you about soon! I am a maker with a distinct vision. I'm stubborn and independent to a fault. I hate asking for help. Now I'm realizing the benefits of working as a team with my mom and boyfriend as we create a new business. I've recommended delegating and it's importance before, but now I'm making sure I do it. 3. Don't Be Shy, Put Yourself Out There. I work with would-be small business owners that think most people will shut down their sales pitch, or that their markets will flop. The actuality is that most people say "yes" when your work is good and you're going to the right individuals and venues. "No" doesn't sting as much as you think. Just move on to the next opportunity. People can't respond to your work if you don't go for it. Putting myself out there saved me and continues to make our business money. I had some awesome opportunities lined up, ones based on lifelong passions, but in the end, I learned the hard way that you can't spread yourself thin and expect to be successful. It never works. Celebrities that seem to have make-up, jewelry, clothing lines, and acting careers...they have hundreds of helpers, they are just the paid face of various industries. You're just you. 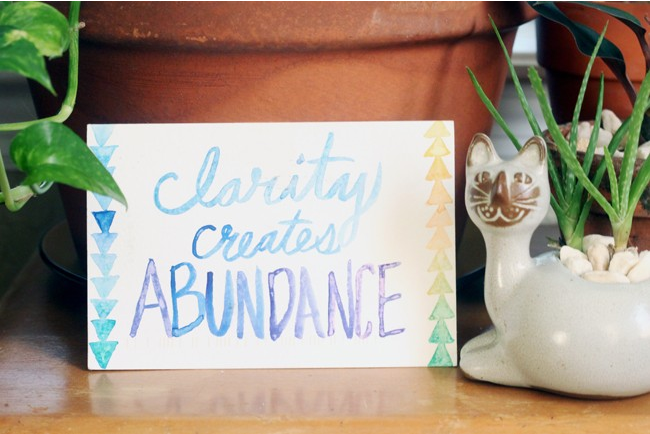 Like my card at the top of this post says, take on less, and you'll find abundance. The ancient wisdom is true. I'm resisting future gig offers, now I know I need my main focus to be everything related to this blog and my body care line. 5. It's Not the End of the World if You Go Broke. Dreams Are Worth it. You can lose it all and when you do, you realize it wasn't as bad as you feared. Through the stress of my recent near-broke scare, I still prefer the brand and income streams I've built for myself much more than working a conventional job! 1 Million times more! And I know I'll get my savings back up. I won't regret this sacrifice when our new business is booming. Anyone else struggling right now? Don't hold back, let's encourage each other to keep going through the hard times. The hand-painted post card, by the way, is by my business coach. She's obviously well aware of my biggest problem- trying to do too much. And keeping her painting near my desk continues to inspire me to clarify and stop killing myself! Sounds like you are on track! Thanks! I'm basically starting over with this new businesses and making the requisite mistakes along the way. But now I'm focusing on profit, not opportunities. Drool-worthy as they are. The money's slowly trickling in as a result. Kudos to you for this post and for your honesty, Vanessa. I agree with the comment above...you are on the right track. And yes...I think at one point or the other, we've all been there. I lived from paycheque to paycheque for a loooooong time when I was younger. Sigh....not my best moments, I tellz yah! Paycheck to paycheck is even more soul-sucking because you're putting all your time and energy toward a job you maybe don't like just to barely make it. I actually haven't been in that particular situation since right now at least I'm barely making it doing what I love exactly my way, haha! Glad you're out of that situation. I did the same when I switched to reselling, I had thousands in the bank and the vintage selling business was doing well when I made the transition. I was not as wise with the switch to my body care business, it has not been as well planned out, but I just couldn't buy another vintage thing. Like you said though, scary, but worth it in the end when you make it. The great thing about hitting bottom is that you can only go up! All businesses have their ups and downs. We are in the 3rd year of our training business and have been hard hit with canceled contracts due to low oil costs (we cater to companies that do business with oilfield companies). What we have on our side is that we live below our means and keep our costs low/stay out of debt. We can ride this out - you will too! Ur, 3 days of work* I hope it gets better for you guys soon! Hey Jessica :) I had $14,000 saved when I started my business as a reseller five years ago. Different things bit into it over time (like a replacement car engine, $4K, ouch, my soul). The biggest thing that drained my savings was deciding to stop buying merchandise cold-turkey and floundering to find my way in the meantime. Doing lots of free or next-to-free work got me in trouble, too. My expenses are SUPER low and I am hyper-careful with money and resourceful. I've never been in debt. And even then, bam, life happens. Ya live and learn and it's taught me to focus on profit while running my own business from here forward. It's hard when you're not getting a set paycheck for your hours to understand you still have to account for them. 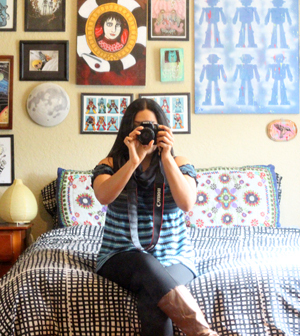 Thanks for sharing your stories on your blog and your debt story here. I've made this mistake of piling on too much and getting in trouble chronically. But we all still have it in us to look at the past, learn from it, and change. My Etsy store is at a freeze right now! Thanks for this motivational post! I am working on it to get it back on track. Thanks for sharing these excellent points! I'm intrigued about your well-paying "low-thought" part time job. I'm also fiercely independent - I need to learn to ask for help more! Thanks for the story and advice, I'm realizing the same thing. some great points.. and good advice. we were suffering from stretching ourselves too thin last year.. this year we are starting to put ourselves and our health first and errands and to do's second. Always the good way to go. Working to do the same here.